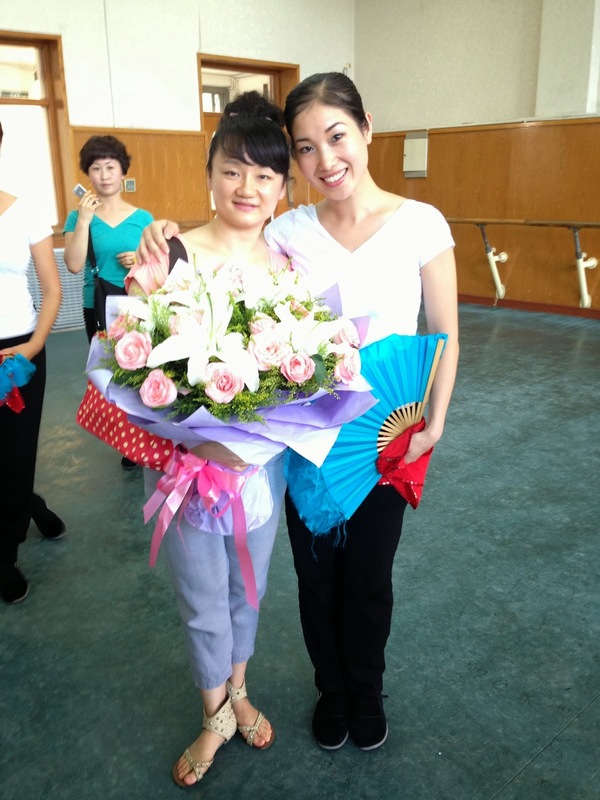 At the end of July, I went to the dream place for dancers in China, the prestigious Beijing Dance Academy, for the forth time. This time, I was taking Advanced Chinese Folk / Ethnic Dance course. It was an intensive three weeks' course learning three different folk or ethnic dances from Southwest of China: Yi, Miao and Zhuang; we learnt one style within one week with an assessment / performance at the end of each week. I was very honoured to be awarded Lisa Ullmann Travelling Scholarship Fund (LUTSF) for the second time after 6 years since the first time, who supported me for my flight to Beijing. Summer in Beijing was not particularly pleasant. It was hot, humid and infamously smoggy. 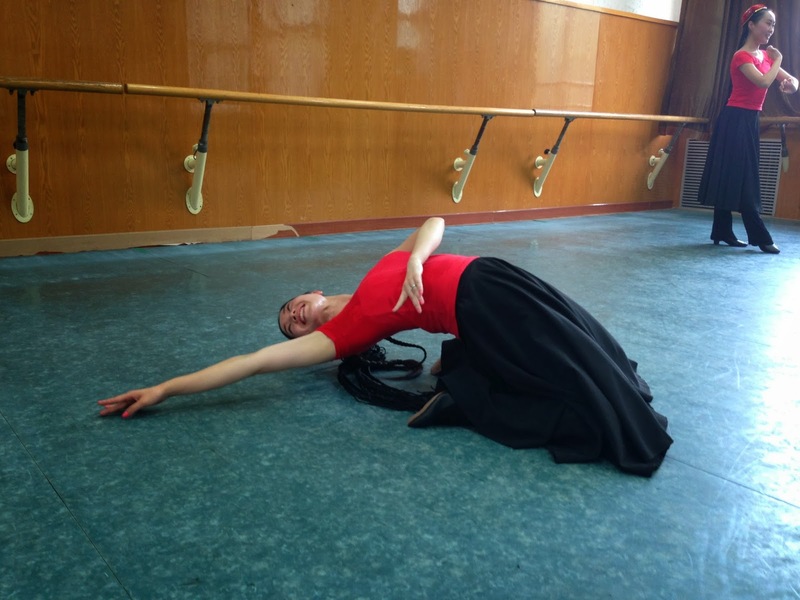 So vigorous dancing in such climate was fairly challenging and made me tired quickly especially when I had not danced much for a while, but simultaneously this kind of training boosted my stamina and built fitness effectively. China is a remarkably diverse and multicultural country with official 56 ethnic groups residing in the country, each of which has distinctive costumes, languages, customs, music and arts as well as dance. Over 90% of population in China is Han ethnic and the rest 10% is 55 ethnic minority groups including Mongolian, Uyghur, Tibetan, Korean, Yi, Zhuang, Miao, Bai, Dai and etc. Ethnic minorities are renowned for their affinity and flair for dance and music, which is an eminent part of their daily life. Yi, Miao and Zhuang, these three ethnic groups, mainly live in the provinces of Guizhou, Yunnan, Sichuan and Guangxi Zhuang Ethnic Autonomous Region in China. The three dance styles share similarity in rhythmic and energetic characteristics whilst they show differences in their movements, dynamics and quality. 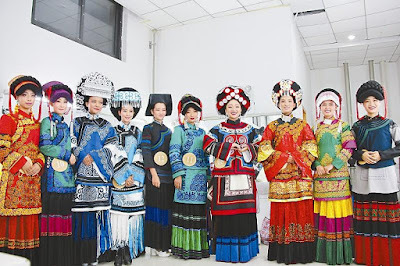 Comparing to other more celebrated ethnic dance in China including Mongolian, Uyghur, Tibetan, Dai and Korean, the dances from these three groups are less known and less popularised but are getting increasing interest from dance artists and mass population. 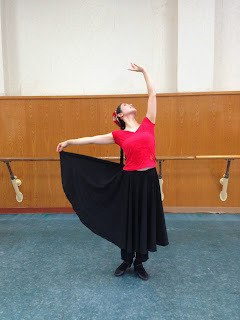 In this training course, we learnt six different styles and routines including Ma An Shan Beating Song 马鞍山打歌，Hua Yao Yi 花腰彝, Left Foot 左脚，Hua Luo Adagio 花倮慢板，Hua Luo Allegro 花倮快板, Nan Jian Beating Song 南涧打歌. Beating Song or Da Ge is one of main styles from Yi ethnic dance; Yi people do the dance mainly for celebrating occasions like weddings and festivals. This particular style is from Ma An Shan area in Yunnan Province, Southwest of China. It is very energetic and rhythmic with dancers stamping, clapping and doing fast footwork. The signature attributes for this style are constant clapping and rapid movements. Dancers clap in an anticlockwise shape with hands in a cross shape while dancing in a quick tempo and change directions swiftly either side to side, forward and back or in a circle. Left Foot is characterised by bouncy body with relaxed waist part and loose head swaying up and down. Dancers dance on tiptoes most of time to create that bouncy motion. For this style, dancers tend to step on their toes first, then ball and then heel with their upper body leaning forward and back flat creating manoeuvring of climbing hills while shovelling up things on their back. It has allegro and adagio styles with the former being upbeat, fast and playful and the latter being mellow, soft and elegant. 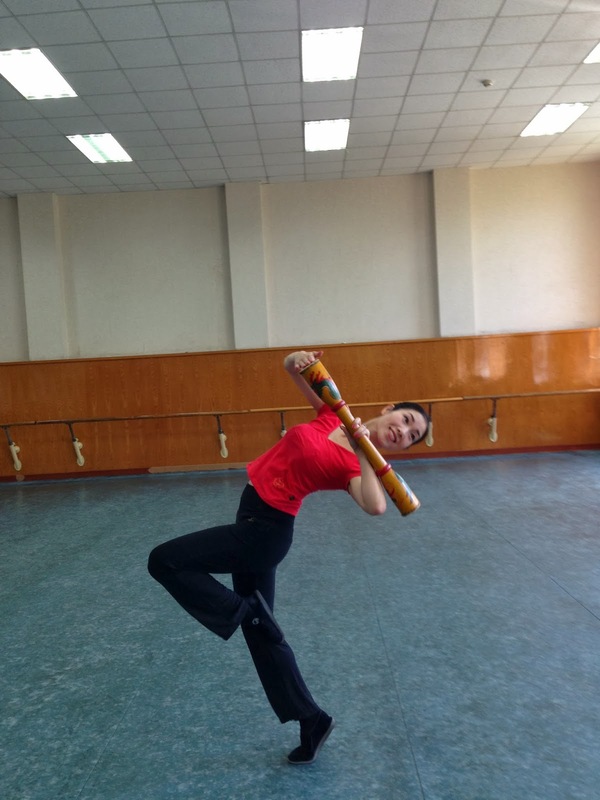 Compared to Ma An Shan Beating Song, Nian Jian Beating Song is much slower and sedate. Dancers make grounded stance and move the upper and lower body of the same side in opposition to our natural movement; for instance, when dancers reach out their right leg forward, they push their right shoulder forward rather than left one. 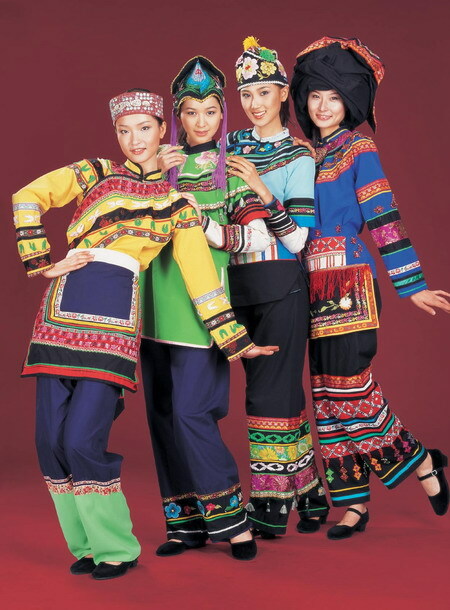 Embroidered costumes and elaborate silver jewelry feature prominently in Hmong ethnic dances. In Miao culture, silver ornaments not only equal high social status, symbolizing prosperity and happiness, they are also believed to possess the power of warding off evil. 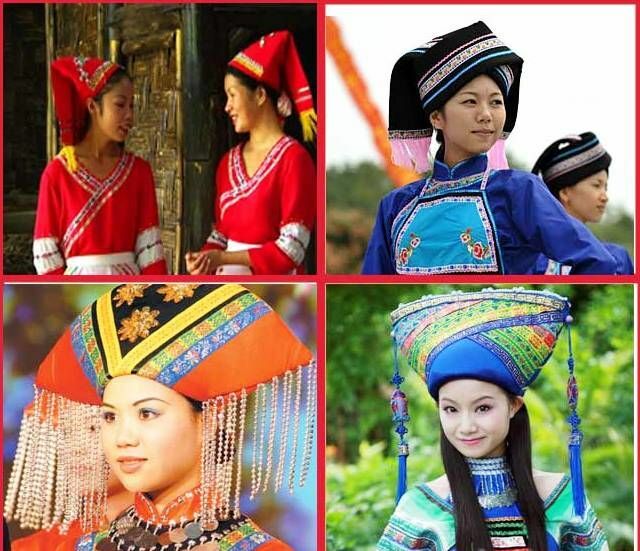 Interestingly enough, Miao females like wearing their hair in a high bun on the right side of their head, which is similar to the hair styles of terracotta armies from over 3000 years ago; according to historians, Miao people did have influence on people of Qin dynasty or earlier when the terracotta army was built. oops. 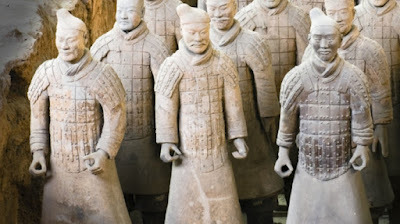 I became a terracotta army. 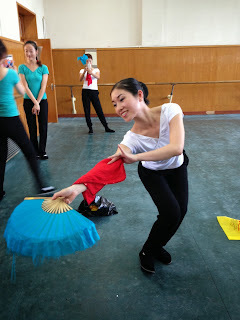 For this course, we learnt five styles of Miao dance: Drum Routine (Basic Routine) 鼓组合, Shoulders & Steps 肩与步伐，Drum Stamping 踩鼓，Bridge Stamping 踩桥，Fan Pai 反排. The signature movement of this routine is swinging two arms in opposite directions up and down forcefully with the front arm either in the chest level or above the head; when the front arm comes down, knees bend and the upper body leans back; when the arms swap the position, knees and the body straighten. The arm movements lead to the natural motions of the body and head. In this style, a lot of movements are initiated by the shoulders and totally relaxed arms are subsequently swayed freely and broadly. Dancer sway arms side to side leading to the body turn either half a circle or a full circle; dancers also do stamping, sliding, clapping and jumping in this style. Dancers sway arms up and down and throw the upper arm backwards to its maximum extent while lifting a knee to its highest point or walking while they are squadding low. The signature movement for this style is the upper part of arms move up and down rapidly with the head swaying up and down and also one foot is lifted sharply in front of the other thigh as if kicking a shuttlecock. 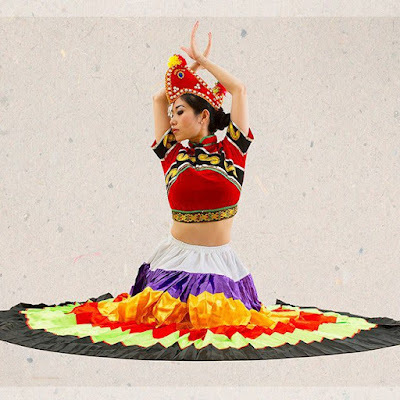 This is the most symbolic style for Miao ethnic dance. It is very upbeat, energetic and bold to powerful drum beats. Dancers lift their foot as described in Bridge Stamping style while swaying their head as well as the upper part of the arm on the same side as the lifted foot backwards rapidly and then recover slowly. The typical movement of this style is hopping sideways while swaying arms (one forward and one backward) followed by lifting one foot high and rapidly and simultaneously looking down to the same side as the moving foot and subsequently spinning around on one foot either half circle or a full one; this movement can be done in various combinations. Zhuang is the largest ethnic minority group in China mostly inhabiting Guangxi Zhuang Ethnic Autonomous Region，located in Southwest of China famous for its stunning sceneries in Gui Lin and Yang Shuo. Zhuang people are renowned for their singing talent. Their dance styles are closely related to their daily activities, ritual and religion. Compare to the previous two dance styles, Zhuang dance is more varied in terms of styles, dynamics and movement quality, and also generally less vigorous and more delicate. Zhuang ethnic dance is influenced by other dance styles or ethnic groups like Mongolian dance, Dai dance and classical dance. The movements are fairly controlled and grounded, that requires dancers to use their breathing (inhaling and exhaling) at the point of changing a position or a movement to generate the fluidity of the movements. It has influences from other ethnic dances including Mongolian and Dai dance. This style is closely linked to their ritual and belief about witchcraft. Dancers' basic stance is the back slightly hunched, arms forming a circle shape with fingers naturally spreading out and eyes fiercely looking forward to fashion an image of a wizard. Dancers sway their body forward and back and change directions sharply following a small and swift jump. The basic stance for this style is the same as Sway and Bounce. Eponymously the dance is characterised with twirling hips around and also pushing pelvis forward and backward sharply to signify birth and express local people's hope and praying for reproduction and offspring. This is a more feminine and exquisite dance from Zhuang ethnic dance with some movements from classical dance and opera. The step or walk in this dance is slow and flowing with an accent at the beginning. There are many types of tea picking dance in China from different regions of the country. Zhuang Tea Picking dance is cheerful and breezy depicting a joyful scene while Zhuang girls are picking tea with arm swaying, finger flicking, hops and jumps in the dance. 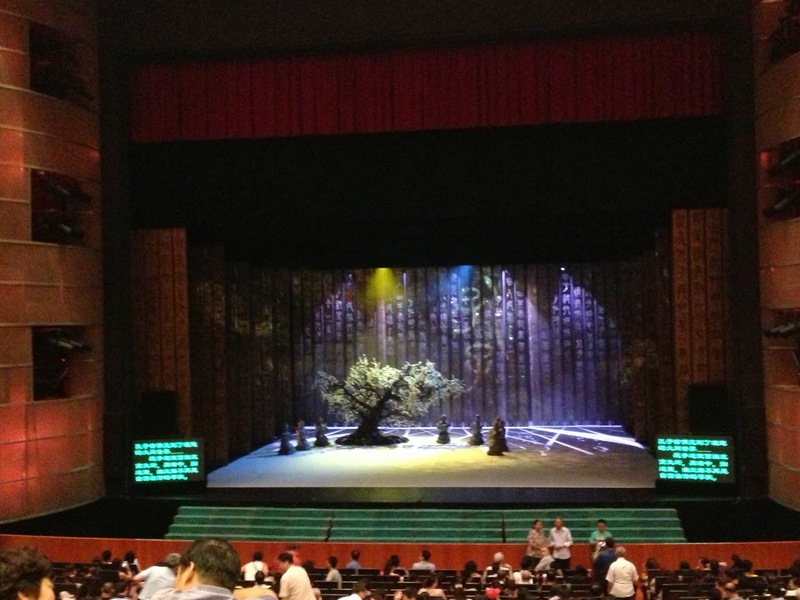 Beijing is the hub for arts and culture with a good choice of theatres and shows. 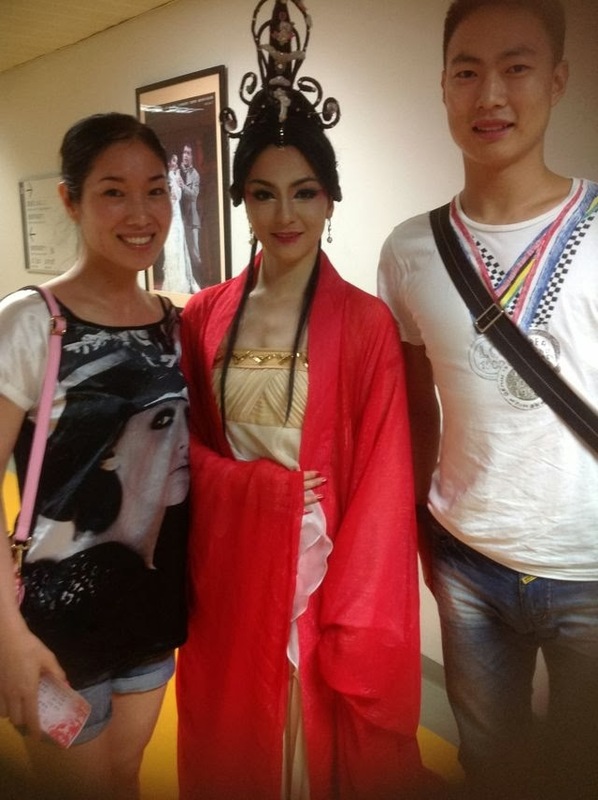 August was a dance season with many spectacular shows to watch so I would certainly not like to miss this special occasion and watched several classical and contemporary dance shows and plays. 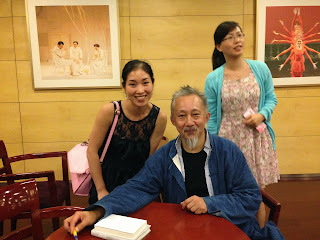 I also met up with some of my artist friends in Beijing to catch up and talk about possible future collaboration. Upon the completion of the course, I was awarded a certificate. Since I came back to the UK, I have shared the dance I learned in this trip with the audience in Liverpool and China during the Chinese delegation's visit to Liverpool in September and my trip in China in October respectively. The governor of Qian Dong Nan prefecture in Guizhou Province, where a great number of Miao people live, has expressed his interest in appointing me as their cultural ambassador in U.K. In the pipeline, I am planning to produce a Chinese ethnic cultural show next year including the three dances I learned this time and also develop new dance pieces from these three ethnic groups to perform in the U.K. In summary, this trip has given me a great opportunity to learn new Chinese folk dance styles, inspiration and information for my choreography and creative producing; it will thus provide British audience a chance to experience new Chinese dances and gain deeper knowledge about China and Chinese ethnic culture. Additionally I made new friends ad connected with old contacts so the trip strengthened my professional and personal networks. Moreover, on a personal level, the training has enhanced my self confidence and a sense of accomplishment by challenging myself with unfamiliar dances and gaining new skills within a short time period. Finally, I want to thank LUTSF and my family and friends who supported me for this trip. Thanks to the funding from P.H. 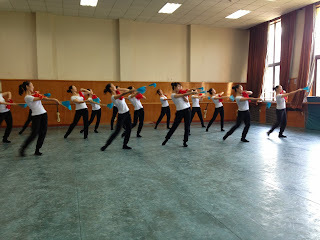 Holt Foundation and the support from my family, I went to Beijing Dance Academy for the third time to take Chinese folk dance training this August. Compared to the pleasant British summer weather, the summer was quite scorching and suffocating in China. 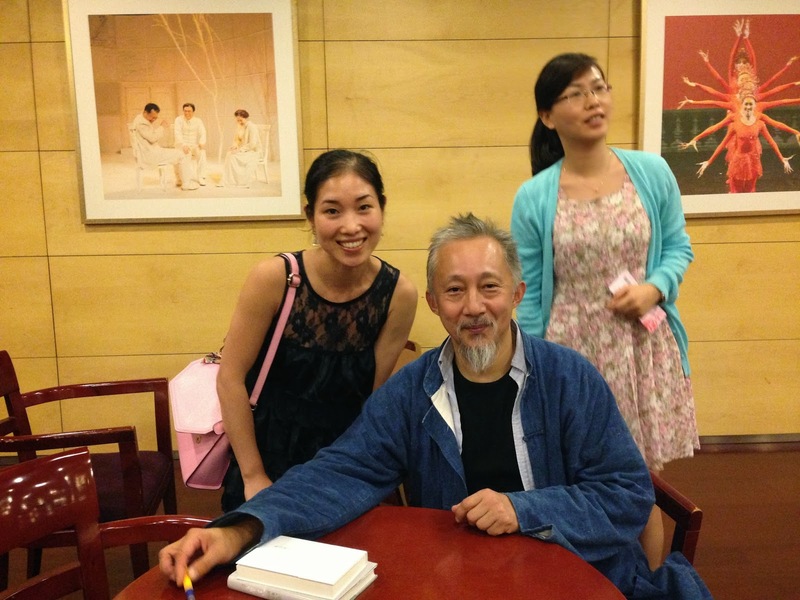 I arrived in Beijing on Sunday evening, 29th July from Shanghai. 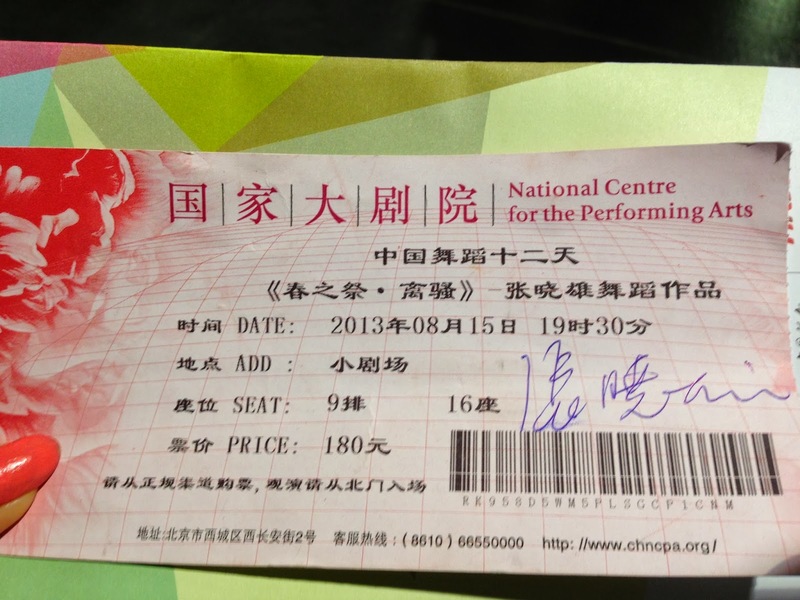 It was nearly 2 years and half since I was in Beijing last time. 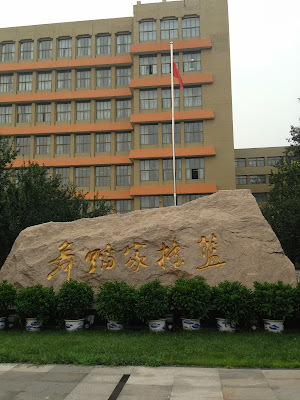 For the same reason and dream, I came to this city and this school again but it was only 3 weeks compared to 4 months previously. The course started the following day so I had a very tight schedule on my arrival. But having already confirmed the accommodation through a friend beforehands and being familiar with the school, I had no trouble to settle down instantly. I was very pleased that I could live a life like that again, just being a student and focusing on dance, which was such luxury for me. I stayed in a domitory where I shared with other five lovely young Chinese girls, who were a dancer teacher, two dance students, a music teacher and a fashion design student. It was fun living in a small room with other people, which reminded me of my university life in China and my trainings in Beijing Dance Academy last two times. But when there were five rooms in the house and 20 or so of us had to share one bathroom, the competition of getting to use the toilet or having a shower was obviously intensive and was a test of your speed and patience, which however added something interesting and memorable to my stay. 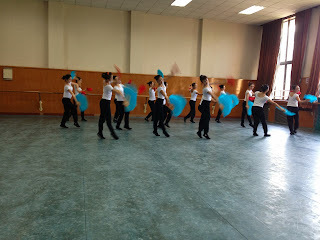 The course I was taking was Chinese folk dance, which consisted of three different types of advanced folk dance in China: Hai Yang Yang Ge--a fan dance from Shangdong Province, Uyghur ethnic minority group dance from Xinjiang region in Northwest China, Yao ethnic minority group dance from Southwest China. So we learnt each of those three dances in a week. The training was quite intensive; we had classes 6 days a week (Monday to Saturday with Saturday for an assessment or final performance/sharing day) and 6 hours a day. It was a very new style for me. I was a bit nervous at the beginning as I had no idea what the dance was like and what I was supposed to learn. 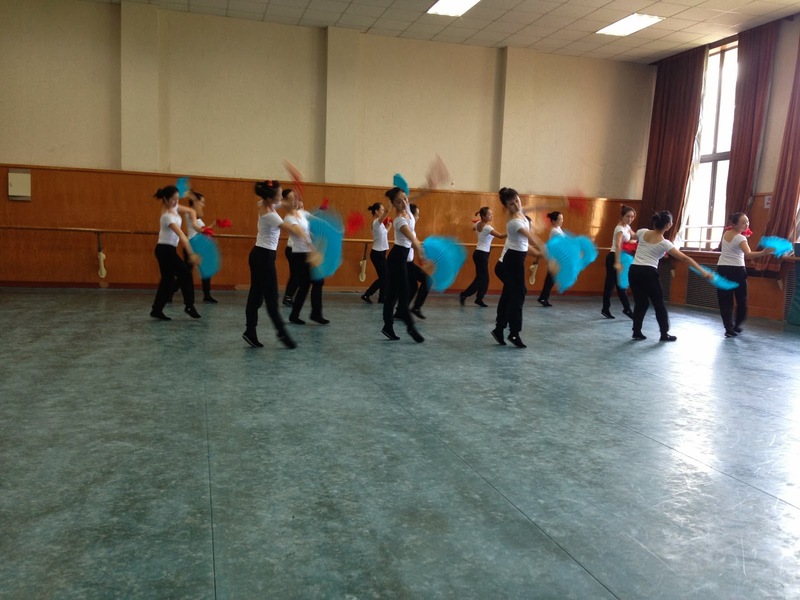 So the first two days I was like a totally blank sheet and robotically copying the teacher's moves with no a clear concept about this style of dance. Talking about the teacher, she was an interesting figure; a small, fiesty and articulate with good sense of humour mid-30 lady; she was an experienced and dedicated teacher and could deliver her message clearly and make lessons very interesting. We were learning the dance by different moves and routines each day. 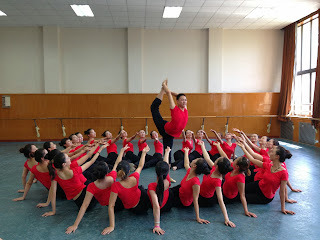 After repetative practice and the teacher's coaching, I gradually gained a vague idea about this dance. Furthermore, as the style is related to Jiao Zhou Yang Ge, another fan dance from the same province which I was more familiar with, I could relate to my existing knowledge to this dance. But I had to say that I really enjoyed the dance. It was challenging but beautiful with various dynamics in the movements. This dance is the most familiar one to me out of the three I learnt in the summer. 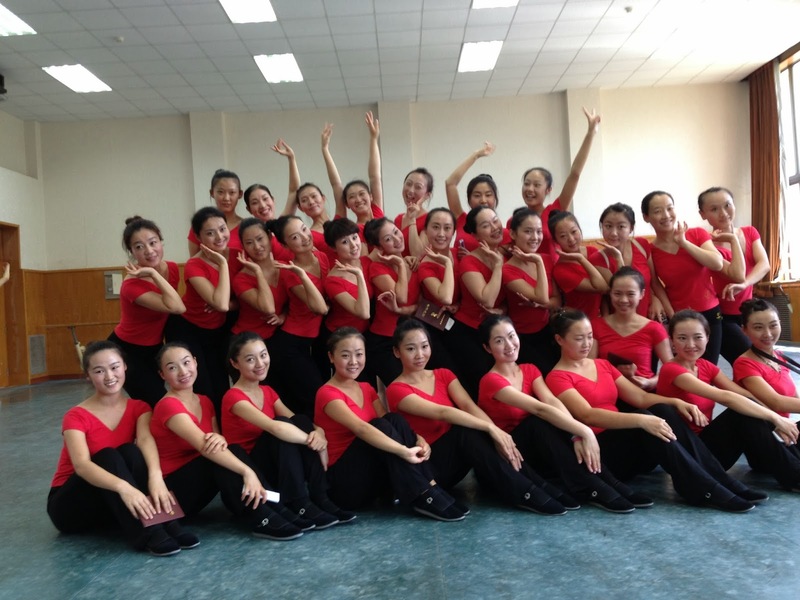 It is very popular and widely performed ethnic/folk dance in China. Uyghur is one of the largest ethnic minority groups living in China from Northwestern part of the country. I came across and started performing this dance style when I was only 5 years old and also took a couple of lessons while I was studying other Chinese folk dance at Beijing Dance Academy in 2006 but I had not studied the style comprehensively and systematically until this summer even though what I learnt this time was only a very small part of this kind of dance style. This ethnic dance has been one of my favourite ones for many years. As a Han Chinese, the main group in China, Uyghur is a very intriguing and mysterious nationality for me as it is very different from us in term of culture, tradition, language, arts, music and dance. Xinjiang is where Silk Road started and located on border with Russia and other former Soviet Union countries, so it has a lot of influence from Europe and Middle East and it is not hard to see the similarity with those countries in culture, dance, music and even people's appearance. A lot of people may mistake Uyghur people from Eastern Europe rather than China as they look quite 'exotic'. Also with Islam being the main religion, we can see rich Islamic elements in their music, dance, costumes, language, architecture and life style. Dance and music are an important part of Uyghur people's life; they dance and play music at festivals, weddings, celebrations , party or after a meal and they were born dancers regardless of age and gender. Xinjiang Uyghur dance requires dancers to elongate their lines and stand tall and straight; it beautifully presents elegance and femininity. Uyghur dance has several different styles and each style has different pattern of rhythm. The dance music has very strong drum beats. The most common style is Sanam, whose rhythm is 'Dong Da E Dong Da, Dong Dong Da'. We did 5 Sanam routines and 1 Tse Ke Ti Man routine, which has time signature 6/8 mainly from the southern area of the region. Sanam is generally upbeat, cheerful, energetic and playful; whilst Tse Ke Ti Man is slower, softer and regal or aristocratic. 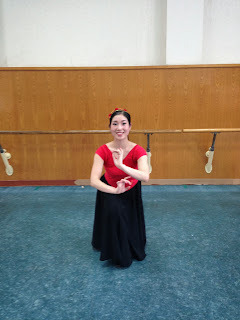 The signature movement from Uyghur dance is head moving sideways in common with Indian dance and also distinguished wrist movements and foot steps. Also fast turns and knee spins are another common movements for this style of dance. 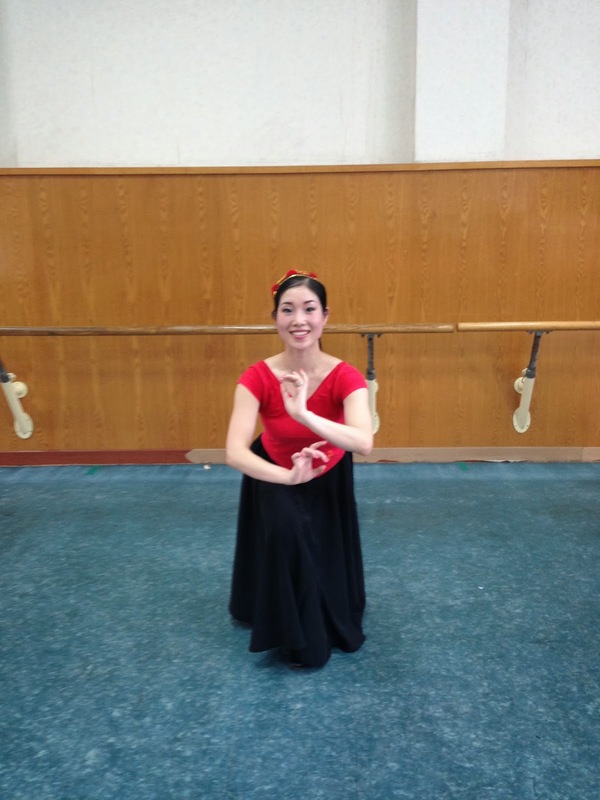 From learning this dance, I improved my lines and now pay more attention on my extension of my arms and legs. We had a different teacher for this dance. She was quite a different character from the first teacher. She was tall and more layback but gave good instruction; she liked to make jokes with us so the lessons were always quite enjoyable. I had not seen or done this dance before, the same to most of us in the class, so were were complete beginners. 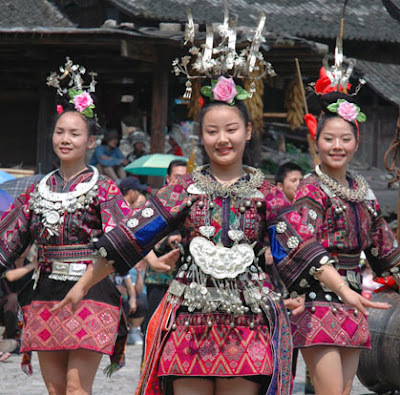 Yao ethnic people mainly live in Southwest China including Guang Xi, Yunnan and Guizhou. It is rather a small ethnic minority group compared to Uyghur, Yi, Mongolian, Tibetan and Korean and its dance has not been exposed widely. Yao ethic is a rather defensive and passive nationality. A lot of them live in a deep mountain like tribes and are far away from the city life. Their basic foot position is toes turning in and twisting; untwisting the body are the signature moves, which illustrates Yao people's uncompromising and strong-willed characteristics under poor living condition and invasion and suppression from other nations in the history. Before we started the lessons, I was a bit worried but also excited. Well, on the the very first day I found this was a strange and challenging dance, for I struggled to do the moves correctly and was picked on by the teacher several times. The second day I saw a little improvement but not much. The moves from this dance style are quite unusual and I could even use 'weird' to describe them. Like most other students, I became a bit frustrated as I had no idea about this dance and did not know what I did wrong and what I did right. I was counting down the days when the course would finish and wished the time would go faster. But as the week went along, I started understanding it and enjoying myself. 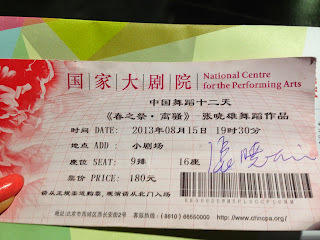 I was put right in the centre of the 1st row, which gave me some pressure. We learnt 5 routines all together in the end. 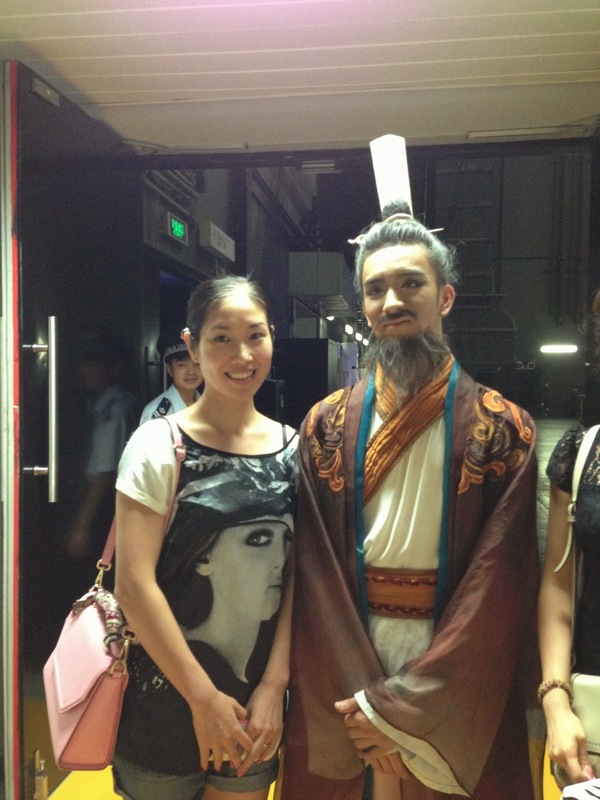 Dancing with Yao long drum was great fun and also was my favourite part. The teacher for this dance was another different person. She was very conscientious, dedicated and generous with her time and knowledge. Also I found out that she was once teaching for a Confucius Institute in London for half a year so her experience in living in the UK brought us a bit closer. After we finished the course, she said to me that 'I hope you can continue promoting Chinese culture in the UK, which I cannot undertake any more.' I feel very honoured about this 'mission' she gave me and will certainly do my best. An the end of the final performance of our last dance Yao dance, we were all awarded a certificate for the training at Beijing Dance Academy this summer. 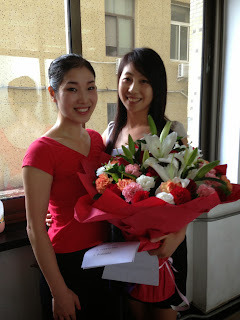 When it was nearly the end, I did not want it to finish and wished it would be longer so I could learn more dances. 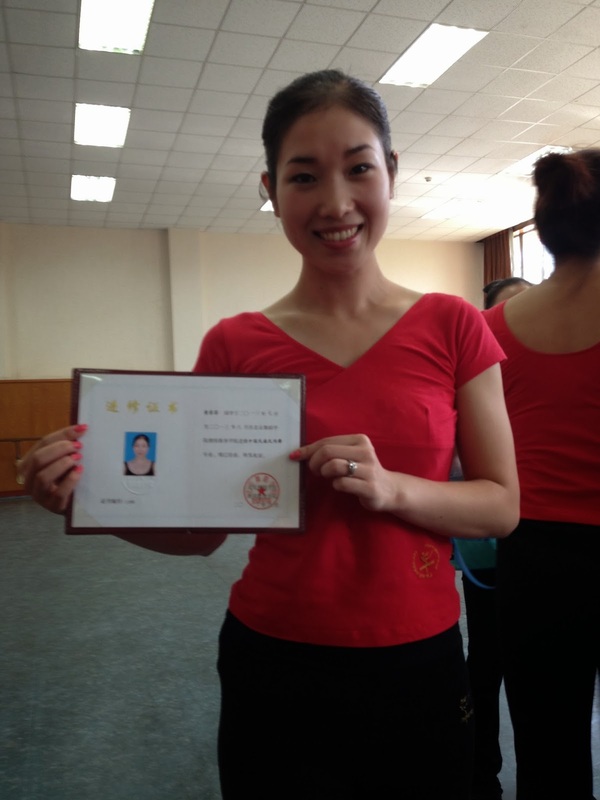 3 weeks went speedily while I was learning new dance and gaining new knowledge. I made new friends over there and will cherish the time I spent at Beijing Dance Academy in the summer. 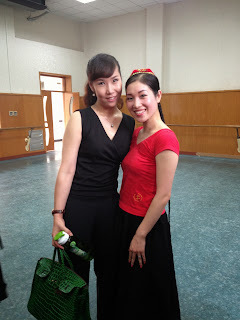 To sum up, the training at Beijing Dance Academy this summer was very informative, useful and beneficial for me as a dancer, educator and creator. I have learnt new dances, gained deeper knowledge about Chinese folk dance and cultures, enhanced my dance technique, enriched my choreography and producing ideas as well as teaching resource and also broadened my networks in China. I hope I will have a chance to further my training there again in the future. 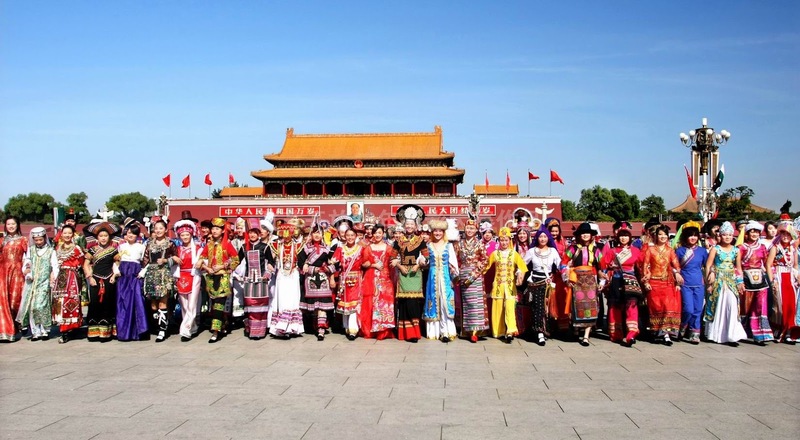 Beijing is probably the best place for arts and dance especially the traditional forms. I went to see three dance shows: a dance theatre show 'Sea Silk Road', a contemporary dance show 'The Rite of Spring' and a Classical Chinese dance show 'Confucius'. They were all excellent work but my favourite one was Confucius, which was outstanding and world class and beautifully presented Chinese culture through marvellous choreography, dance, music, costumes and staging. I loved the show so much that I stayed behind for a while until I could go to the backstage to take some photos with the performers. Now I am back to the UK, I am planning to impart my knowledge and skills I learnt this summer to the people in this country by giving lessons, delivering workshops, developing new dance pieces, delivering performances and shows of those new dance styles. Check out my upcoming projects later this year on www.fenfen-huang.com.